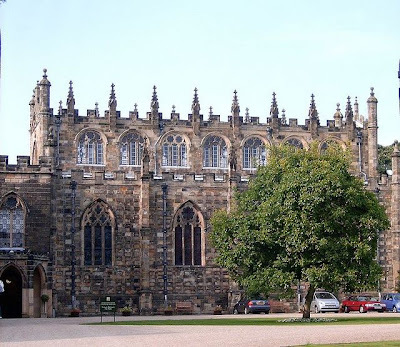 Auckland Castle (also known as Auckland Palace or locally as the Bishop's Castle or Bishop's Palace) is a castle in the town of Bishop Auckland in County Durham, England. The castle has been the official residence of the Bishop of Durham since 1832. 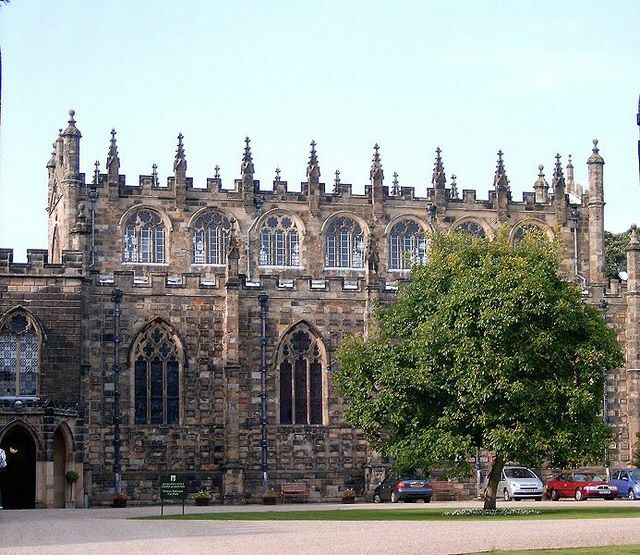 However, it has been owned by the diocese for more than 800 years, being established as a hunting lodge for the Prince Bishops of Durham. It is more like a Gothic country house than a true castle with a military function. Photos were permitted in the public rooms throughout the castle, with one exception. 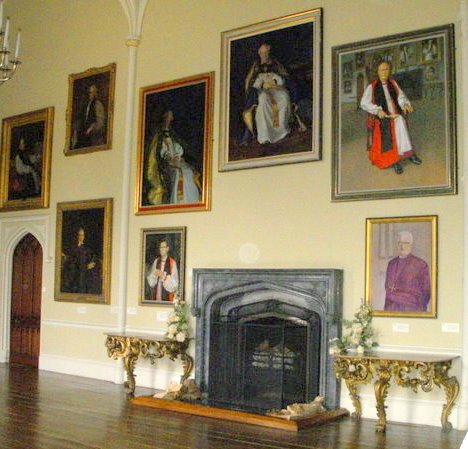 Below, in the center over the fireplace, is Michael Ramsey, who was Bishop of Durham before he was appointed Archbishop of York and then Archbishop of Canterbury. A larger view of the portrait is here. The one exception to photos was the room I wanted to photograph most, the long dining room with Francisco de Zurbarán's paintings of Jacob and his sons. I was prepared to go from painting to painting and photograph them all, but it was not to be. The castle's long dining room is home to 12 of the 13 17th century portraits of Jacob and his 12 sons painted by Francisco de Zurbarán. The room, in which they have hung for 250 years, was specifically designed and built for them. In 2001 the Church Commissioners voted to sell the paintings which have a £20m valuation, but relented until a review in 2010. 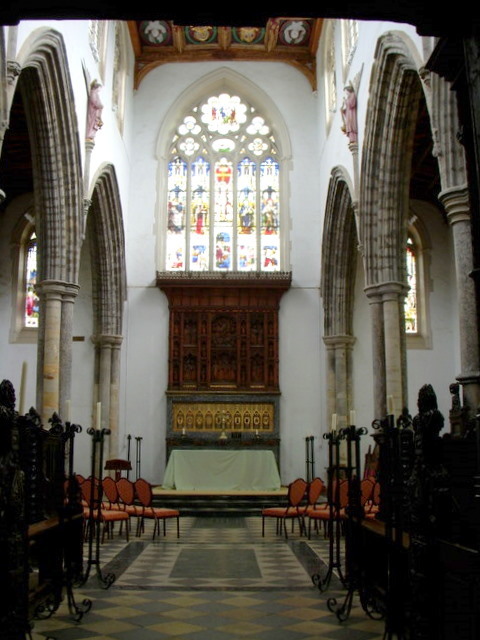 On 31 March 2011 Church Commissioners announced that plans to sell off the paintings were shelved following a donation of £15 million from investment manager Jonathan Ruffer. Ever since I heard of their possible sale and removal from their home setting, I've wanted to see the paintings, and my wish was realized. I was able to view the paintings in their proper setting, which was a memorable experience. The paintings and the dining room are indeed impressive. I was thrilled when I heard the news that Ruffer had stepped forward to make it possible for the paintings to remain in place in the dining room at the castle, where they had been since 1756. 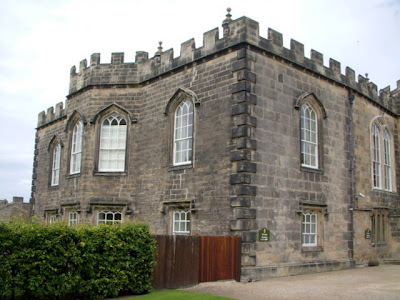 Exterior of the chapel at Auckland Castle from Wikipedia. 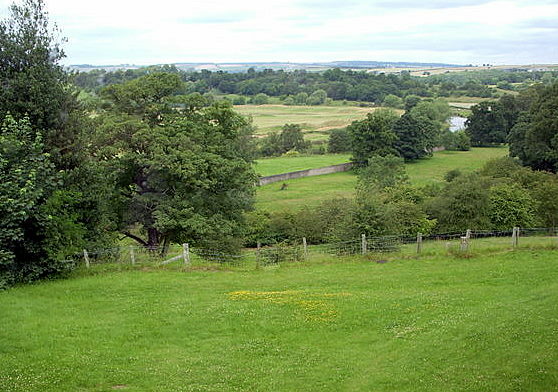 The castle is surrounded by 800 acres (3.2 km2) of parkland, which was originally used by the Bishops for hunting and is today open to the public. 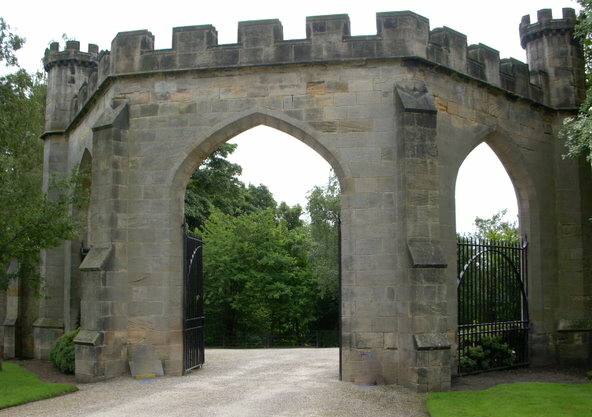 Good-bye Auckland Castle, and good-bye to England. My visit to the castle was my final tourist activity before I left and a fitting end to my wonderful travels throughout the Green and Pleasant Land. Of course, since I don't write of my travels in chronological order, but rather according to the whim of the moment, I have more stories and pictures to come. Mimi, are you really determined never to return? ... Is there no possibility of one final visit? Remember you said to me not so long ago you would come back for a proper journey through the west country. Never say never, Cathy, but it was hard. I didn't dwell on the difficulties during the travels, but I haven't forgotten them. I'd need to break the trip to and fro, and I think I'd need a luggage carrier. Even with wheels, handling the suitcases was awkward and difficult. I notice the difference with age. I'm sure. There must be a way? ... :( You did have a particularly nightmare journey here. Not next year for sure, because I have to save my money, and then the year after, I'll be 2 years older. Lovely pictures and description. I hope you leave open the chance of another visit. Hope for for new adventures! You deserve that. Dammit Mimi you've got to come back so I can cook for you!!!!! I think the Zurburans are dreary, Mimi. Can you imagine living with that bunch on the walls? We'll see about another visit, Ciss. Lapin, I think the paintings are splendid. I couldn't imagine living in Auckland Castle, but if I lived there, I could imagine living with the paintings. All the photos that I've seen represent paintings very poorly and are nothing like the real thing. Don't judge them by the photos. OK. I'll take your word. But in the dining room? Eating as penance? My father was never again asked to say grace at a family gathering after he responded to being unwillingly pressed into service with the "grace" "Jesus Christ, the same today as yesterday". Art in the dining room should be all still lifes of food? Also, don't forget that Zurbarán was Spanish, and the painting out of Spain at his time was generally darkish. Your father was something else. It sounds as though you travel alone? Might not travel abroad be easier for you on some kind of tour? I agree with JCF. I like to travel solo but have just been reading the itinerary of a friend and his wife who are leaving this week for Turkey, Greece and Croatia. I could not help notice the frequent line "collected at airport and transferred with luggage to hotel"
For me (and I think you) it is 'find the train station, discover way to buy ticket, travel to nearest stop to hotel preferably without the need to change lines, follow map printed off google maps and hopefully arrive at hotel'. I guess one day I will have to resort to the guided tour party if I can afford it. JCF, of course you may. I've done tours, and I find they're even more exhausting than traveling on my own. The tour folks get me going too early in the morning and cram too many activities into a day. Besides, I have to follow their timetable, and If I want to linger in a certain place, I don't have the option. On one trip, I had to sleep on a fold-out chair in the living room of a suite, with other guests in the locked-off bedroom. I had a splendid, huge bath, a conference size dining table, but no bedroom, because the hotel had overbooked. After that she used the phrase 'go with the flow' ad nauseam, and the rest of the group wanted to beat me up, metaphorically speaking, for ever teaching it to her. Well, I didn't mean to run on so, but tours are not my cup of tea. It was many years before it dawned on me how close the fruit had fallen to the tree, Mimi. 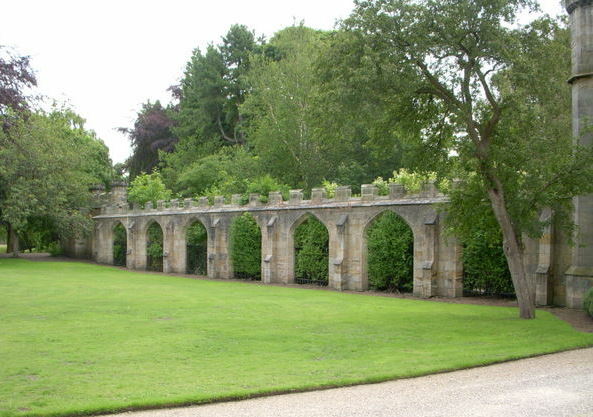 I wish my memories of Auckland Castle were as fresh as yours, though it was 14 years ago for me. Getting about with luggage is a drag and time takes its toll. I shall try to do one major trip a year if I can afford to while I can still get about. Having gone to the gym made the hills of Rome possible but I wished I had more stamina. Then like father, like son turns out to be true, Lapin. Thanks, Paul, I've done foreign travel for three years running now, hoping to cram in as many trips as possible while I was still fairly mobile and alive, but this last journey to England was quite expensive, besides taking a toll on me, and I can't do a major trip next year. All during the Bush years, I never left the country, because I was embarrassed to have him as my president. I don't mind tours to places I feel uncomfortable traveling as a single woman, but traveling alone or with people I know is my preference. Wish I had had an extra day to see Aukland when I visited Durham. I never let politics interfere with travel. After all I worked in Vienna during the Reagan years. Amelia, when I think of the places I could have gone in those 8 years while I was younger, I believe I made a mistake. However, I don't know that I could have done differently. I'd cringe at the thought of being in another country. Silly, I know.